Lin Ke 'Robinson Crusoe' (2011), installation view. Image courtesy Constantin Brosteanu. We live and breath in a world that we are told more and more is destined to fail. Our relationship with a term such as climate change may differ from individual to individual, but it is a notion most of us will be familiar with. Concentrating specifically on the consequences that the rising number of electronic devices being thrown away are having, Digital Matters: The Earth Behind the Screen at the Centre For Chinese Contemporary Art is crowded with burdening epiphanies. Awaiting us as we enter the gallery is the poignant explanation into the term ‘Sacrifice Zone’, an area of land specifically dedicated to the disposal of electronic waste (e-waste). The UN estimates that at least 4 million personal computers are disposed of every year in China alone, the full effects and impact of which we are still learning about. One artist surrounding himself in these matters is Dani Ploeger, whose lecture-come-performance ‘Cybernetic Organisms #2 (blood)’ (2015-17) involves the artist placing his own blood onto a previously redundant Central Processing Unit he recovered from an electronic waste recycling factory in Hong Kong. Due to the work’s fabrication the heat of the chip causes the blood to dissipate into the environment, stressing our own susceptibility to this digital landscape, and when caught live is accompanied with Ploeger discussing cyborg bodies, e-waste and decay. Adding to such analyses are MAP Office and Yang Yongliang’s works ‘Liquid Land | Solid Sea’ (2017) and ‘The Night of Perpetual Day’ (2014). Appearing to counteract one another ‘Liquid Land | Solid Sea’ features a tedious narrative that lists off the islands which are caught up in the complexities of the South China Sea territorial disputes. Such a serious subject is dragged on and on, diffusing it with a meaningless personality that eventually leads us towards a sense of dismissal. A peculiar tactic for such densely loaded subject matter, one that leaves behind uncertainty. ‘The Night of Perpetual Day’ however is a consumable venture into the shadows of our contemporary cities. Mesmerising us with large-scale digital imagery, the work is full of rapidly rewarding humorous changes. It’s design relatable yet alien, it cleverly unpicks any city’s desires, promoting development and the consequences of such powerful ebbs and flows. 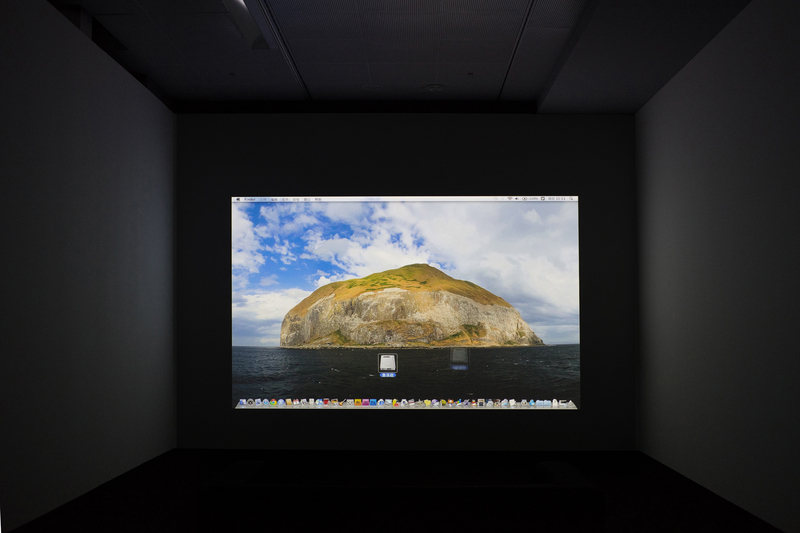 Lin Ke’s video entitled ‘Robinson Crusoe’ (2011) features a mouse cursor dragging a hard drive icon across a picturesque desktop background. Accompanied with it’s own noises of the ocean one’s initial engagement with this work is fairly tranquil yet ultimately dull. A quick Google search however and it appears Ke’s title is referencing an 18th century book whose main character, a castaway, spends 28 years on a desert island. Noting that Ke, born in 1984, will have been 28 years old when making this video advocates that he has actually composed a sincere self-portrait of himself. He is a modern day castaway, stuck within this digital landscape. With this discovery, the work starts to submerge viewers into solitude with depressing thoughts of the relationship we have with our surroundings and how much time we spend staring into screens. Digital Matters: The Earth Behind the Screen is competently equipped to shift and dent opinions of our dying biosphere. However, the value of exhibitions dealing with such serious topics like this are undoubtedly entangled within their legacy. The works on display are clearly capable of igniting an instantaneous critical joyful fuss, yet it will be what we do with these feelings once we leave the Centre For Chinese Contemporary Art that really count. Commonplace gestures of ‘liking’, ‘sharing’ or ‘commenting’ are a start, but it appears we are crying out for sustained levels of critical engagement. Upon leaving this exhibition, one wonders how long it will be before we fall back to our default disposition of fortuitous ignorance? Digital Matters: The Earth Behind the Screen, CFCCA, Manchester. 3 November 2017 – 4 February 2018. Ashleigh Owen is an artist and writer based in Manchester.